Changes to the International Constitution must be ratified by at least one-half of the constituent national conferences. The Church of the United Brethren in Christ International consists of national conferences and missions outreaches around the world. We are part of each other, and cooperate to more effectively carry out the Great Commission. The following Constitution is intended to ensure doctrinal unity, encourage cooperation among the national conferences, and extend the worldwide ministry of United Brethren churches. The Church of the United Brethren in Christ International. The General Conference meets every three years to oversee and coordinate United Brethren ministry worldwide. a. The General Conference consists of ordained ministers and laypersons from each national conference. b. Each national conference shall determine the method for selecting its own delegates. c. All officials elected by the international General Conference are members ex officio of that Conference. d. All delegates have full and equal rights of participation. a. The General Conference guards the church’s historic position of firmly upholding biblical absolutes, allowing freedom in areas not clearly mandated by Scripture, and encouraging tolerance and unity when differences arise. b. When practices, teachings, or decisions within a national conference challenge the doctrinal integrity, cooperative relationship, and/or international ministry of United Brethren churches, the General Conference has the authority to apply disciplinary action. National conferences can appeal such actions. c. The General Conference accepts national conferences into the membership of the Church of the United Brethren in Christ International. 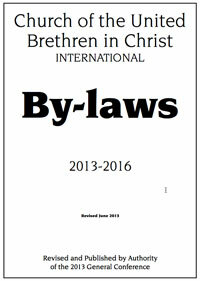 d. The General Conference considers amendments to the international Constitution, Core Values, and Bylaws. e. The General Conference determines the way in which any international ministries it establishes and the expenses it incurs are to be funded. f. General Conference must not pass any rule which changes or eliminates the Confession of Faith. This Constitution and the Core Values can be amended by a two-thirds vote of the General Conference, followed by ratification by at least one-half of the national conferences. The national conferences shall act on the proposed amendment during their first meeting following General Conference. If and when one-half of the national conferences ratify the amendment, the amendment shall be declared to be in effect, according to the procedure established by the General Conference.